My family and I had a great time at the second annual Trains! event, reading an advance copy of Old Tracks, New Tricks to a group of little engineers and sharing activities from and inspired by my book. We made our own pull trains, built track stacks with the little tracks from the book, built DUPLO supports and tunnels for the trains, and even made some wooden track art! Trains! 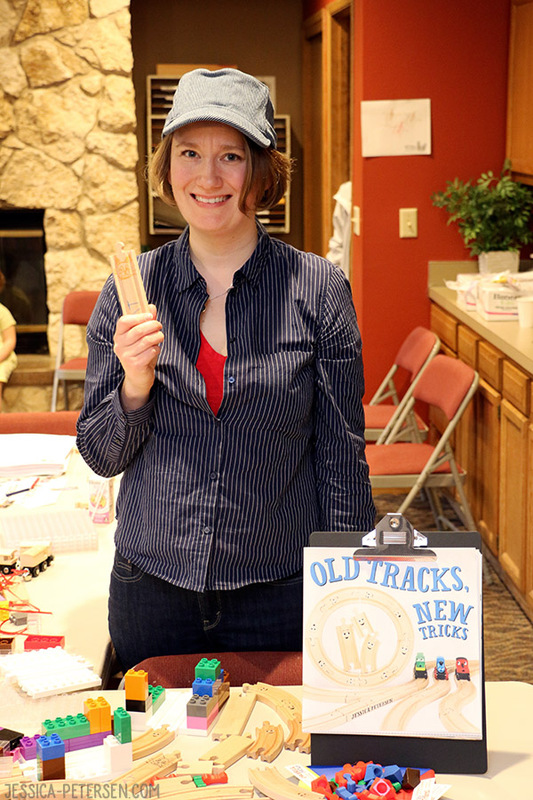 — held each year at the Inglewood Presbyterian Church in Kirkland, WA — is an one-of-a-kind chance to play with an amazing variety and quantity of wooden trains and other toy trains. The event is organized by Tom Stephenson, inventor of the wTrak modular train table system, or as I call them, the coolest train tables in the world. We’ve been attending train shows since my son was a toddler just to play on those beautiful train tables. We’re looking forward to going back next year — plenty of time to dream up even bigger and better track-tivities to show the kids!